After a day’s correction on Mon. Jan 14, the daily bar chart pattern of SPX 500 brushed past bear resistance at 2600, and soared above its 50 day EMA to close at 2670 with a 2.9% weekly gain. 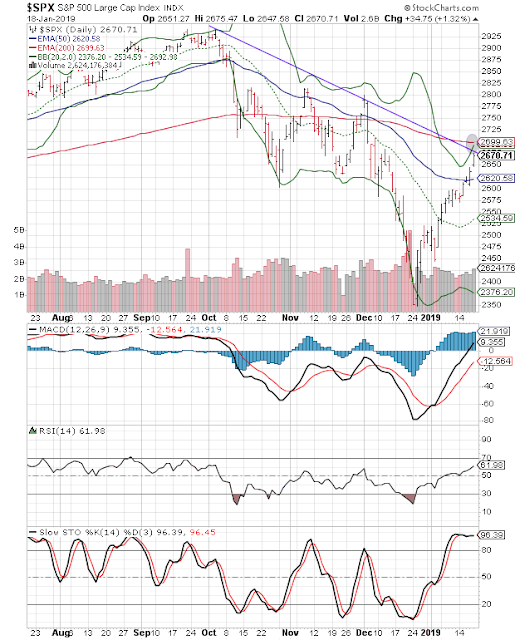 Looming overhead is a resistance zone (marked by light gray oval), where the sliding 200 day EMA, the upper Bollinger Band and the (purple) down trend line have converged. Bears can be expected to put up a stronger resistance when trading starts on Tue. Jan 22 (after the long weekend). Daily technical indicators are looking bullish. MACD is rising above its signal line in bullish zone. RSI is moving up above its 50% level. Slow stochastic is moving sideways inside its overbought zone, and can trigger a correction. On longer term weekly chart (not shown), the index closed well above its 200 week EMA and just above 20 week EMA in long-term bull territory, but remains below its falling 50 week EMA. Weekly technical indicators are in bearish zones. MACD has started to move up inside its oversold zone. RSI and Slow stochastic are moving up towards their respective 50% levels. 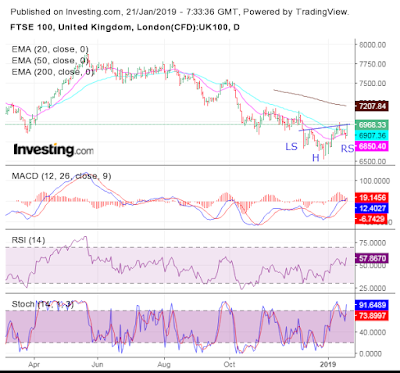 The daily bar chart pattern of FTSE 100 consolidated sideways during the first three trading days – facing resistance from its 50 day EMA and getting support from its 20 day EMA. On Thu. Jan 17, the index dropped below its 20 day EMA and the 6800 level intra-day, but recovered to close at 6835 (just below its 20 day EMA). Bulls bought the dip on Fri. Jan 18. The index remains below its falling 200 day EMA in a bear market, but closed above its 20 day and 50 day EMAs with a 0.7% weekly gain. FTSE may have formed a bullish ‘inverse head and shoulders’ reversal pattern with an upward-sloping neckline. Daily technical indicators are looking bullish. MACD is moving sideways above its signal line in bullish zone. RSI has bounced up after getting support from its 50% level. Stochastic has re-entered its overbought zone. On longer term weekly chart (not shown), the index tested resistance from its 200 week EMA and closed just below it at 6968. It remains below its three weekly EMAs in long-term bear territory. Weekly technical indicators are turning bullish. MACD has crossed above its falling signal line inside its oversold zone. RSI is rising towards its 50% level. Stochastic is moving up above its 50% level.